As promised here is the tutorial for the pattern weights I made a couple of weeks ago. These are easy peasy and anyone can do these. Every time I do one of these tutorials I am reminded of a horrific assignment I had in Senior English Comp. A paper writing the instructions on how to tie your shoes. Sounds easy doesn't it? NOT! I failed abysmally. So hopefully the tutorials here are a bit more successful. As I said in the previous post I use a rotary cutter for almost everything, even Swiss batiste and silk organza. I use pattern weights when I can. I am less apt to run over a pin when using weights and that results in less nicks in my cutting blade. 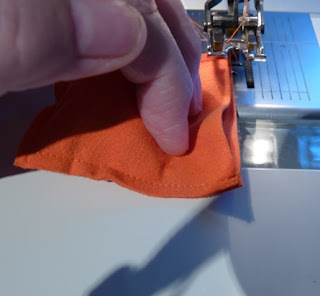 Using a rotary cutter is more accurate and if you are doing baby clothes a consistent error of 1/8" or 1/4" all the way around a piece can make a difference in construction and fit. If you don't believe me, do an experiment yourself. Trace out a sleeve pattern. Pin your sleeve to some Swiss batiste; now cut it out with a pair of shears. Next trace out your second sleeve. Place it on the batiste either with weights or pins. Cut it out with a rotary cutter. Now compare the two sleeve pieces. Are they the same? When you use shears, you lift and cut the fabric. That can result in inaccurate cutting. Plus for me using a rotary cutter is wayyyy quicker. I am an American living in a microwave age, I want results and want them now! So if I can get through the mundane part of the project faster then that is more time to spend on the fun part. Now off with the lecturing and on with the tutorial! I used a walking foot but not required. I copied my weights, (there is NO original thought) from some table favors I received at a SAGA National convention. They were 2.5 inches square and so are mine. At my local fabric store they had 9 x 12 pieces of Ultrasuede for $5 each. You can get 6 weights out of each piece. More if you make them a tad smaller. 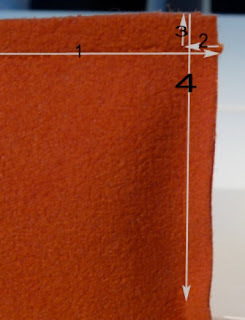 Straighten the edge of your suede by trimming a scant amount off with your cutter and ruler. Cut strips 2.5 inches wide. 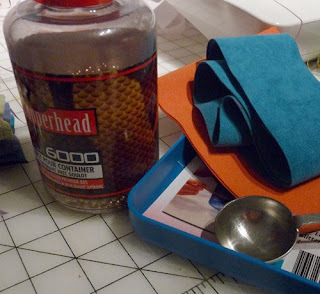 Then cut those strips into 2.5 lengths to get your squares. Of course you know that it will take 2 squares for each weight. I know I didn't need to tell you that, but on the off chance you didn't know. I used a walking foot to stitch my squares. 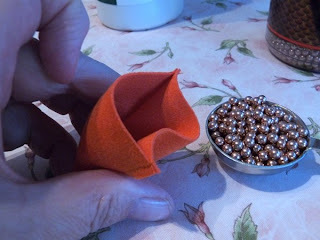 It helped keep the edges even without pinning which you don't want to do with suede. If you don't have a walking foot don't worry. They are small so you can get away without pinning. The squares are top-stitched together with a 1/8" seam. 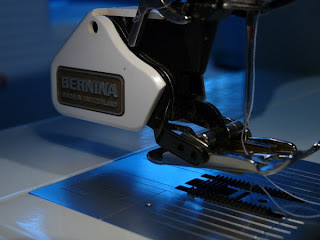 A more accurate way to get 1/8" seam is to line your fabric edge up at the 1/4" mark on the throat plate of your machine. Then you bump your needle over to the right 1/8". This allows both feed dogs to come in contact with your fabric and your fabric to be more firmly held down by the presser foot. The result is a more accurate seam with less wobbles. 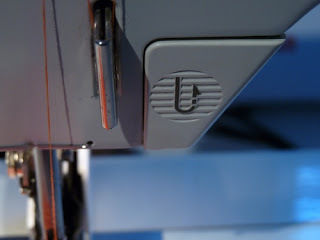 A button I rarely use, the back-stitch button. In clothing construction I rarely use this button. 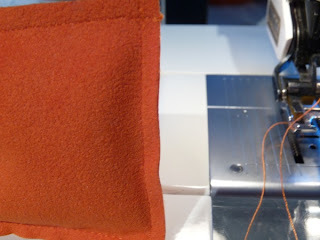 I dial my stitch length down to a .5 or less at the beginning and end of a seam. It creates less bulk at your seam ends and intersections. But I used it lot making these. I didn't want to just pivot at the corners, I was afraid with the weight of the BB's and regular use that the pivoted seam would give way and I would be standing in a puddle of BB's so I decided to stitch off the edge of the fabric on all four sides. Well I also didn't want to cut threads on all four corners either. Time consuming and can get raggedy looking. So I back-stitched at every corner. I hope this is clearer than mud. I stitch to the fabric edge (#1) then I back-stitch back to the upcoming seam line(#2), pivoted my fabric, back-stitched to the fabric edge on the upcoming seam(#3) then proceeded to stitch the seam (#4). Stitch 3 sides of the square leaving one side open. You now have a little packet ready to fill. The pattern weight I copied contained 2.5 oz of BB's. Or for me 1 tablespoon. Not all tablespoons are created equal so you might want to check yours against a kitchen scale. Carefully pour your BB's into the packet. Try not to get as many BB's on the floor as I did. I hope I found them all or my poor husband may end up replacing our Dyson vacuum. That would not make him happy. The tricky part is that last seam. Again without spilling your BB's all over the floor or (gasp) into your machine hold the edges of the opening together. Though I think it would be really hard for the BB's to get into your machine . 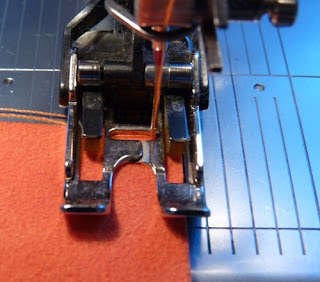 Using your fingers, hold the BB's back away from the presser foot and keeping the suede packet closed stitch that last seam from edge to edge back-stitching at the beginning and end for strength and safety. Ta-da!! Your first pattern weight. I takes longer to cut these out than it does to stitch them together. They are very durable, heavy enough to hold your fabric but light enough to be manageable. The slight nap of the suede helps them grab the fabric. I hope you will send me pictures of the one you make. You amaze me, woman! Your pictures are beautiful and the instructions are great. 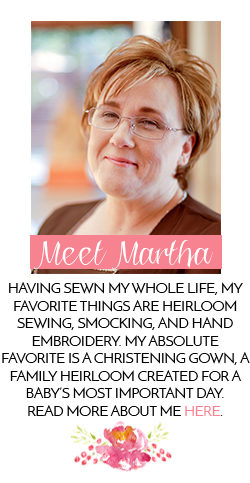 I like those Martha. Very nice and look like they will be easy to store. Good instruction. What a great tutorial, Martha! The pictures are wonderful! Great idea! You explain things really clearly too. How about if you put a dab of glue in that last seam before sewing it to keep those BBs from slipping out? Can I adopt you as my Mommy? Goodness you are a wealth of knowledge. My Mom sent me these weights that are great, until one of the toddlers drop them onto the hardwood floors and scare everyone within a 2 room radius as they break open and fall apart. I like them but yours are smaller so they are easier to use on smaller patterns. For years I have used kitchen knives instead of pins. Pins are used and accounted for after each use because I have children who might swallow them (disabled). This is a great idea, and if you would like to make them even less expensive, visit your local thrift shop and pick up a set of ankle or wrist weights in the sporting goods section (I got a set of each for 50 cents) and reuse the weights inside them.... they work great! This is the best tute I've seen on the subject. Funny - I've been sewing for 40 years, but only use my rotary cutter for quilting, never garment making. Your explanation makes so much sense, though. I didn't think I'd have enough control of the cutter to cut garments without a ruler. I'll have to try it. Thanks. What on earth are BB's. I want to make some of these weights but I never heard of BB's (and there I gave myself away, yes I am not from the US nor Europe). Should have written this with the other post, but it just dawned on me. I'm from the Caribbean surrounded by miles and miles of sandy beaches. Is sand a good alternative for the BBs? Do you think so? Tempest, to answer your first question. 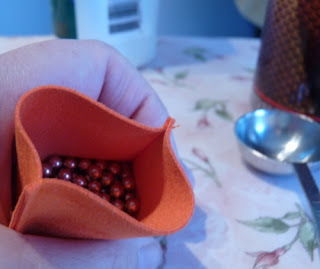 BB's are small copper/metal beads used in a BB gun. They can be found at sporting goods stores in the hunting section. Second, lucky you living in the Caribbean. And yes, all of that free sand would work just great! Just be careful with it around your sewing machine. I wouldn't want the working of your machine to get sand in it.